This is a stimulating and creative book, which communicates in a practical way the benefits of studying the style of literature and rhetoric of the New Testament letters in order to enrich our preaching. To help us do this, Tim MacBride uses the perspective of the Graeco-Roman world as background to the New Testament. An understanding of the literary style or genre of any Bible book is essential to its right understanding. And understanding this style is enriched if we can see it in the context of the rhetorical and literary styles of the cultures of the Bible writers. MacBride’s book shows how productive this approach can be. This is a simplified and practical version of his Preaching the New Testament as Rhetoric: The Promise of Rhetorical Criticism for Expository Preaching, Australian College of Theology Monograph Series, Eugene, Wipf & Stock, 2014. It is clearly concerned to enhance expository preaching, and does so by asking what the Bible book is intending to do. Each book has a purpose: it is written to persuade. We need to ask, ‘What is the desired result, and how does it achieve it?’ Our preaching needs to be persuasive as well as clear, if we are to do it justice. Our sermon should be doing what the Bible text is doing, and not contradict, confuse, or cloud it! 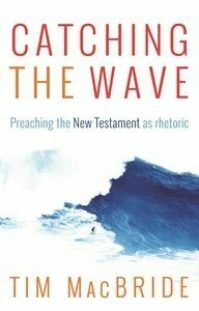 It is well organised, in progressively using various aspects of Graeco-Roman rhetoric, showing their presence in the New Testament letters, and showing how understanding what is happening enriches our appreciation of the letters and their significance, and how this should influence our preaching. It helps us see the emotional content of the Bible text, and its intended emotional impact. New Testament letters are not dry logical arguments! We often use phrases like: ‘Finding the argument of the passage’… ‘Teaching the Bible clearly’… it is time to change our language! If we look for arguments, we may find them, but may miss much else! Clarity is necessary for persuasion, but persuasion is more than clarity. Studying rhetoric opens our eyes to see persuasive theology and emotion. It highlights the variety of motivations in New Testament letters. Our default motivation is often: ‘This is what the Bible says, we must do it.’ Too often we supplant the motivation of the text with this imported motivation. This book opens our eyes to a wonderful range of motivations, each of them carefully and lovingly placed in the Bible by God! I found MacBride’s book very illuminating. However, readers need to be able to grasp the common terms of Graeco-Roman rhetoric to understand it. These include: forensic, epideictic and deliberative rhetoric; ethos, pathos and logos; and exordium, narratio, propositio, refutation, and peroratio. Each word is clearly explained, but if you tend to panic when you meet too many unfamiliar words, you will need to concentrate hard to read the book. But it is worth it! Complementary approaches could study the New Testament in the context of the rhetorical style of the Old Testament writings, or in the context of the rhetoric of Jewish writings and synagogue sermons. There are some signs of these in the New Testament [the Gospels, Hebrews, James, Revelation]. Jesus’ rhetoric included some aspects of the Wisdom tradition, the prophetic tradition and the scribal tradition of teaching the law, though it is also clear that he was not a conventional rabbi! His rhetoric of cutting off hands and feet needs some explanation to contemporary people, as does his rhetoric of hating father and mother. I think the title of the book is too broad for the content. Its real focus is the New Testament letters, rather than the New Testament as a whole, and especially Paul’s letters. Indeed its focus is really Paul, and his ministry as the apostle to the Gentiles, and the practical outcome – in his speaking and preaching – of his goal of engaging with ‘those not having the law’, and of serving by becoming ‘all things to all people’ [1 Corinthians 9:21,22]. It is good for us to see this goal being worked out, and it is an aspect of Paul’s ministry which we should imitate. I do notice that teachers and preachers who tell us that we do not need to think about contextualisation often do it instinctively, unconsciously, and expertly! MacBride claims that guilt as motivation and insulting opponents do not work today [pp. 21, 128-30]. We certainly need to be aware of these issues in our preaching of these passages. However the Bible’s rhetoric is intrinsic to its verbal revelation, and we must not ignore it or cover it up. While we must preach and teach the Bible to our contemporaries with sympathy and understanding of how they will hear it, we must not pretend it is not an historical revelation. But I do agree that we should be aware of how people today hear ancient theology and rhetoric. My own practice now is that I do not preach about sin without 5 minutes on the God-given dignity and God-intended glory of humanity. Otherwise when I talk about sin, people hear me saying that they are inherently and absolutely worthless, and they think this because they have learnt that they are tiny specks of accidental, irrelevant, and uncreated cosmic dust. Or, to put it another way, untaught people need to learn Genesis 1 and 2, before they learn Genesis 3, as God intended! It is only when we know our high calling as humans made in God’s image that we can safely and rightly begin to understand sin and guilt. At the same time, I am impatient of the modern tendency to horizontalise sin, so that it becomes nothing more than sin against others and sin against ourselves. The God-ward impact of sin is our most serious problem. If that is not solved by Christ’s atoning death, then we are lost in sin, guilt, death, judgement, and wrath. I have also noticed that while insulting people is a venerable Australian tradition in my age-group, and is a rhetorical device to indicate approval if not affection, that is less true among young Australians, especially those from overseas. So I need to take that sensitivity into account when I am teaching or preaching on a text in which opponents are insulted! And I also point out that Paul does not insult everyone! Furthermore, our preaching also needs to allow for the fact that expounding ancient texts requires a particular rhetoric. This is a particular challenge for us, for our society and culture do not have the rhetorical tools to expound ancient texts; it is not a common feature of our civilisation. A great preacher of the 17th century is described as ‘projecting the eloquence of Scripture’. May we do the same! We need to understand Scripture’s eloquence in order to project it. MacBride’s book will help us to do so. John S Chamberlin, Increase and multiply: arts of discourse procedure in the preaching of Donne, Chapel Hill, University of North Carolina Press, 1976, p. 28.